I love our new logo! Let me tell you why. But before I say any more thanks to Graphic Designer Grant O'Sullivan for producing it, along with our new website and this blog. The logo is themed on a very beautiful modern stained glass window in our centre’s home, St Marys Luton. The Magnificat Window was created and installed in 1978 by stained glass window artist of repute, Alan Younger. In the early years of my work in Luton we would gather as a church team several days each week under the window to pray. Many times as we prayed for our peace-building work, as I reflected on things that were taking place, as I sought God fervently for understanding and leading, and as I was encouraged by others, I'd look up at the window and be inspired. The window and the message in it became a central part of the growing work of peace and reconciliation. The Song of Mary, often called the Magnificat, is one of the oldest Christian hymns of worship, and has been sung by the church since that time. 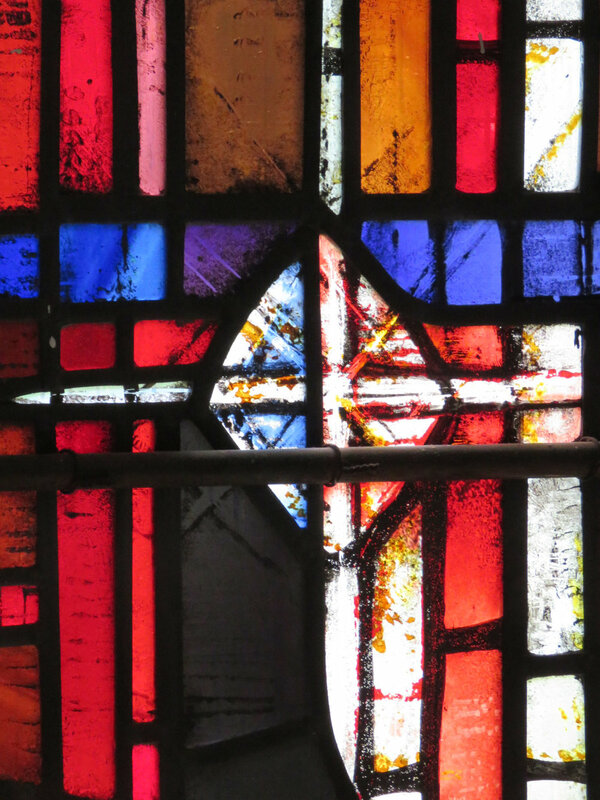 This isn't the place to go more into the Magnificat, the window, it's inspiration, and Alan Younger the artist - there's more on that on the St Marys blog. Marys song reminds us that right at the heart of God’s purpose for Jesus, right at the heart of Christian message was peace and justice, and social change! Hitler had just that year come to power in Germany. Bonhoeffer had already spoken out strongly against him, and his policies, especially towards the Jews. Building up a church that would be true to the Christian message in its entirety in the midst of Nazi German would become the defining point of Bonhoeffer’s work until it led him to his death just weeks before the end of the war. I'm deeply inspired as I reflect on Bonhoeffer’s words. I'm motivated by reading of times when reading of this passage, or use of liturgy based on it, has been banned because it is held to be subversive, to foster revolution. Apparently the Magnificat was excluded from its traditional place in evensong in churches run by the British East India Company in India. Years later Gandhi requested that this song be read in all the places where the British flag was being lowered on the final day of imperial rule in India. The junta in Argentina forbade the song after the Mothers of the Disappeared displayed its words on placards in the capital plaza. And during the 1980s, the governments of Guatemala and El Salvador prohibited any public recitation of the song. (The Magnificat as SocialDocument). . It is our hope as Christians that as we seek peace and justice for all in Luton we will be true to the prophetic challenge of the Magnificat. It's a song for change, a song of revolution! Not a violent revolution, but which still brought the greatest revolution in the story of the cosmos. And we will be reminded of it by our logo! http://compassreview.org/summer14/3.pdf. These accounts of the banning of the Magnificat are hard to source. I will update this as I can.